Bendpak - RS-750 Truck Spray Wash Cabinet with Skimmer - Gary Bloom Sales, Inc. When you’ve got something big and dirty, clean it better with Ranger. This powerfully versatile, 53-gallon capacity spray wash cabinet degreases even your filthiest car parts in no time flat. Comes with free bucket of soap. If your service garage handles a lot of larger vehicles, then this extra large capacity spray wash cabinet was designed just for you and your customers. With an inside compartment height of 54″, it can handle anything from engine parts to tractor parts. Each RS-750 is equipped with a large, 30″ diameter turntable that can carry a payload up to 1,000 lbs. 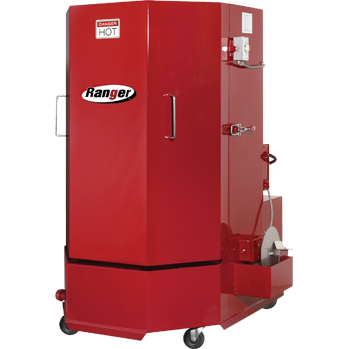 Like all Ranger spray-wash cabinets, the RS-750 is built to last. We constructed this cabinet and door with heavy-duty 12-gauge steel and then coated it with an industrial two-step primer and powder coat finish. Durable construction combined with simple operating controls, brass nozzles, a gasket-free door and a large, 70-gpm pump make the RS-750 tough enough to take on the heaviest, dirtiest auto parts you can find. 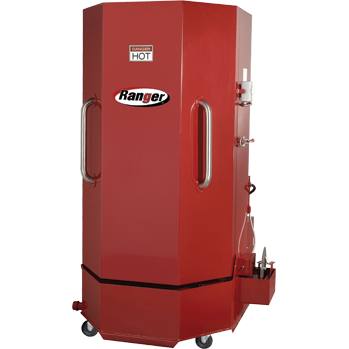 Each component washer cabinet by Ranger includes a robust trap filter to secure large particles greater than 1/8″. Filter basket is removable for unfettered access to the cleansing solution tank and easy maintenance. Every Ranger parts washer features a centrifugal pump specifically engineered for parts washing applications. The motor and pump are located at the rear of the cabinet and shrouded by a protective cover to prevent contamination.